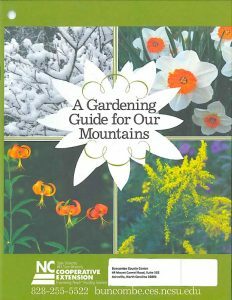 A Gardening Guide for Our Mountains is an Extension Master GardenerSM Volunteers of Buncombe County publication with expanded information on waterwise gardening, firewise landscaping, and preparing your garden for winter. Growing fruits and vegetables, flower and herb gardening, composting and mulching, caring for trees and shrubs are featured, too. The helpful monthly “To Do” list is an essential part of the Guide. The contents were updated in 2018. It’s a dandy gift for the gardeners in your life – or for yourself! Gardening Guides are available for purchase and pick-up at the Buncombe County Extension Office for $10 (cash or check payable to Buncombe County Extension Master Gardener ). Or call 828-255-5522 to order by phone and request shipping, for an additional $2. Garden guides that require shipping will not ship until payment of $12 is received. Please send all payments to Cooperative Extension, 49 Mount Carmel Road, Asheville, N.C. 28806, ATTN: Buncombe County Master Gardener.